How I Make My Blog Rank Higher in Google Search Results? Mostly bloggers ask me about the strategies which I used to rank my blog higher in search results of Google. I simply reply them with some simple strategies used by me to rank higher my blog. But bit by bit I started receiving the same question again and again that's why I decided to write a post on these strategies publicly used by me in Blogging. Here I would also like to mention that I started this blog 11 months ago and that time I was very new in blogging, but had some passion to deliver my articles and knowledge to people. I started learning new and working techniques of search engine optimization, I accepted that strategies in my blogging after learning. I never went exactly on articles written on different blogs by bloggers. If you're are new in blogging and going to search about blogging in Google, then you will also find articles saying like, "Create backlinks to make your blog rank high in Google". You can check that my blog has not so many backlinks but still ranked higher in Google, Want to know How??? Yes, I'm going to write about my personal experience of blogging and strategies used by me to make my blog more popular in search results. Here one more thing is to be mentioned that my blog is already ranked few months ago in google, at that time some blogs have backlinks in thousands but didn't rank higher in Google. Why??? Don't worry I will tell all and the exact reasons behind this. You can check the status of backlinks of any site using lots of free sites which are proving this service, but I recommend to use Alexa.com, also it will not show you the list of full backlinks as free member but it will tell you the total number of backlinks which a site have. 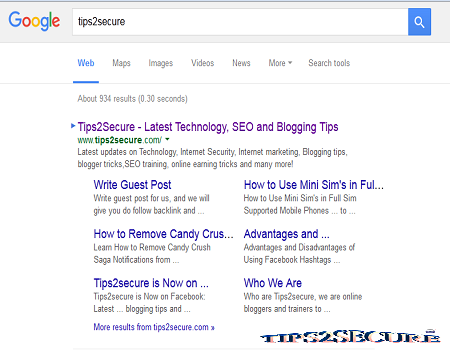 Check in below image, number of backlinks for tips2secure is only 36. Also, search some other sites, and you will find that even some sites with 5000+ backlinks have not been ranked in Google. The reason behind telling all this is only to make clear that only backlinks are not required to rank high your website or blog in SERP's. Its also true that creating backlinks are good for any website or blog. But you should get or create only quality backlinks. 10 baclinks from high reputed site may equal to 500 backlinks from low ranked or less reputed sites with lower DA (Domain Authority) and PA(Page Authority). If you are a guest blogger then write guest only for those sites who have at least 10+ DA and PA to get a backlink. I will also write about how I get backlinks from high PR sites. If you are accepting guest posts only to share or sell links then you might penalize by google and will lose all your rankings. Do read this article Guest post accepting sites might be penalized by google to learn more on what I am saying. 1. Why my blog is ranked higher in Google? Because, I never try to spam with search engines and my blog and also never copied any article from someone's else. I never made large gaps in writing posts. I worked for getting quality backlinks only and it becomes the major reason of high ranking of blog. People who are working day and night for getting backlinks, sometime do bigger mistakes and get backlinks from spammy sites which will result in the wastage of all efforts. Then why we are wasting our time on these things, just focus on your content, promotion readers and a little bit for backlinks but only from reputed sites. Even if you search on google there are many sites which are claiming to give 2500+ backlinks in minutes for free. But trust me guys if you will use that of services to getting links faster then surely it will damage your blog rank, so you should avoid these type of spammy activities. Even you can ask me anytime for help in blogging by using our Live chat option. 2. How I get quality backlinks for my blog? I created social profiles for my blog on Facebook, Twitter, Pinterest, Youtube, Dailymotion, Linkedin etc. and start posting links of blog on that social sites, not with the intense to get traffic but for getting backlinks from high PR sites. Social sites mention above are having high PR and also they are not giving dofollow backlinks but nofollow backlinks from high PR sites increase DA of our website and blogs. Then after I started commenting on high PR sites only on those sites which are related with my blog niche. I also started posting on Reddit.com and Stumbleupon.com, and trust me guys, I got lot of traffic from that sites. Even today also am sharing my posts on all above given sites. Recently I also start submitting my blog post urls on Digg.com. I also uploaded videos on Youtube and dailymotion, and left links of my blog in video description. If you don't know how to create videos and tutorial for your blog to upload on well ranked videos sites like youtube and dailymotion, you should read how to capture screen using screen recorders to create videos for free to upload. 3. How I tell search engines about my blog to crawl? Well, I am using Free Web Submission to submit my blog to all search engines at once. I also use Pingler and mostly Pingomatic to ping and drive organic traffic on blog. Then after I created my accounts in Google webmasters and Bing Webmaster tools. Google webmaster helps you about critical issues faced by Google and Bing webmaster tool helps you to tell about issues faced by yahoo search engine. 4. Additional: How to Get Quality Backlinks? Best method for getting quality backlinks is to write guest post for other blogs. Make a list of some highly ranked and reputed blogs, then start contacting the owners of that blog by going through their 'Contact Us' page. Offer a proposal for the guest blog and ask them that you need dofollow link from their blog for the post you will write for them. You can also write a guest post for our blog Tips2secure by following these guidelines to write guest post. 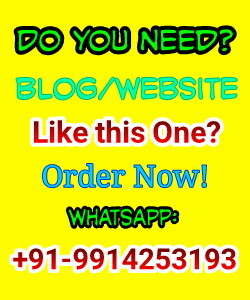 We will give you a Dofollow link for your blog. 5. Why We should add Contact Information and add meta tags (Author name, Country, Language)? You must provide sufficient contact information on your blog. You should also use meta tags to tell search engines about the writer of your blog, language, country etc. If these things are missing from your blog, then it is considered as insufficient information by search engine crawlers. 6. Search Engine Optimization and Static Pages! SEO has also played an important role in ranking my blog higher in search engine result pages. At that time I did not know more about SEO, but I worked on basic things like meta tags (description, language, country, author etc). But you're very lucky because last month I have updated some free SEO tools which can be used by you to optimize your blogs. But if you are very new in blog then go for first steps in SEO for newly created blogs article, which will guide you better. I also did a post on 5 tactics for SEO to rank higher your blog in search engine, so after reading this post you should follow that tactics also. And if you already have done above given steps but still do not getting good rank then you should check for the Main website issues which are holding your site back and have to put some steps to solve that issues. Also create some static pages in blogger like, 'About Us', and 'Contact Us'. These pages are good sign of legality and It build trust in your readers also. I always post articles which are written by me, I have never copied contents to write my post. And I always try to make the length of the posts between 400-1500 words. This length is considered as good by SEO expert's. So guys just follow the above-given steps and you will definitely get some positive changes in your blog. Message: I hope that you have enjoyed 'How I Make My Blog Rank Higher in Google Search Results?' article. However, if you want me to deliver more articles then please share my post. You can use Social Sharing Widget provided at the end of every post. After all, Sharing is Caring!. artikelnya sangat membantu. please visit my blog. First of all if you are talking about Google pagerank, then notr it Google has stopped updating pagerank algorithm for a long time ago, and they also don't have any plan to update ot again. So don't work for pagerank now, if you are checking page rank using free sites and tools available on internet then it will always shows zero, or sites who got pagerank in past are now showing the same rank. And you can get backlinks from any country.. Just try to get backlinks from quality sites, focus on links not on country. It will surely rank your blog in search results. Thanks for your appreciation, and here you are talking for which blog to visit and why?? I would like to clear here that its not necessary to include blog title in your every post or article. But you can use some keywords from title to make your SEO perfect. Moreover its not a big problem or matter of trust by search engines. So don't worry. Thanks for your appreciation. Keep reading this blog. Thank you! now i know what is DA and PA and how to increase them. Hai i want to ask, how much time will google put our article on a search rank? I have try to put a lot of keywords on my blogpost but it still not appear on google search.